Jamie Eldredge is Executive Chef of Noble Hops, “Tucson’s original gastropub.” As the brains and creative force behind the ever-changing menu, Eldredge has helped lead the northwest eatery to great popularity, while establishing himself as an up and coming chef to be reckoned. What was the first dish you had that changed your perspective on food? When I was younger I used to go trout fishing on the weekends with my dad. I remember the first fish we ever ate together so vividly. There was something so captivating to me about eating food that we caught ourselves. I think that experience is what showed me the importance of fresh and sustainable ingredients later in my life. My dad had this family recipe for trout given to him from his dad where the fish is lightly breaded in Italian bread crumbs and simply pan fried in clarified butter in a skillet over a campfire. So delicious and simple. I’m definitely going to get in trouble on the home front for saying this but I have been eating a ridiculous amount of pork belly at the restaurant. Outside of work, I’ve been trying to eat a lot healthier. I’d like to pretend that this is voluntary but it’s more at the behest of my girlfriend – lots of grilled fish and wild grains such as farro and barley. I’ve really grown an appreciation for the complexity of flavors different grains can bring to a dish. Some grains have a peppery quality while other have an almost sweet cinnamon-like quality. My sous chef, Mario, and I have been playing around with grains in the kitchen and are really trying to incorporate their versatility in dishes that you wouldn’t naturally pair with. Of course, most of that is with pork belly. My mom used to make pan seared lemon pepper chicken when I was younger. I loved it. Every night I would plead with her to make that for dinner. For some reason she stopped making it as often which was most likely due to my sisters ongoing complaints about eating the same things. I took it upon myself to make it one day and failed miserably. I added about three cups of vegetable oil to the pan and essentially shallow fried an unbreaded chicken breast. It was awful. The first thing I became fairly decent at making was french toast. My mom had this amazing recipe from my grandmother for french toast using sliced baguette. I spent a few days making it and after awhile I just knew the recipe by heart and proceeded to eat french toast for breakfast for a month straight. What concept, ingredient or food trend does everyone seem to love, but you just can’t stomach? Peanut butter hamburgers. Why? I know I am going to get a bunch of flack for this but I truly do not understand this trend. The mere thought of it makes my stomach turn. I saw a burger at a restaurant that had peanut butter, bacon, a fried egg and ketchup or something. Does that actually sound appealing? But who am I to tell people what they should or shouldn’t like. Personally, that is not for me. I also do not understand America’s obsession with putting ranch dressing on everything. What chef, with us or passed on, would you most like to cook or eat dinner with? Rene Redzepi of Noma in Denmark. I have a total man crush on this guy. The food that he is putting out of that kitchen is bonkers. He almost takes a Japanese kaiseki approach of honoring the integrity and flavors of ingredients only he applies them to European and native ingredients of Denmark. Everything he makes is an experience. He has a dish called the garbage plate or something like that which utilizes things you would typically throw away or use for stock. Then he covers the dish with cooked milk skin. Milk Skin! Rene, if by chance you happen to read this. May I please have a reservation for two placed on the books? What city, other than Tucson, is your favorite place to eat? This is a toss up between San Francisco and Salt Lake City. San Francisco has some of the best seafood I’ve eaten on the west coast. There is also tiny French cafe just outside Japantown that makes the most delicious Eggs Benedict I’ve ever eaten. Anytime I visit I eat there at least twice for breakfast. Salt Lake may seem like an odd pick but their culinary scene has exploded over the past couple of years. There is a Spanish tapas restaurant in downtown Salt Lake that is out of this world. Speaking in junk food terms, what is your favorite guilty pleasure? Ginza Sushi is phenomenal. Their broiled miso marinated sea bass is quite possibly the best dish in Tucson. Vero Amore’s pizza is hands down the best artfully crafted pie in the city. And, Twisted Tandoor food truck is on another level for Indian cuisine. With a figurative electric chair in your immediate future, what is your last meal? Either Hamachi Kama with steamed rice and Sochu. Something about broiled collar just blows my mind. It’s so simple and yet so delicious. Its one those dishes that showcases how simplicity is often the best route to take. Or pan seared ribeye with brandied wild mushrooms and roasted potatoes with an icy cold Ruination IPA. C.J. 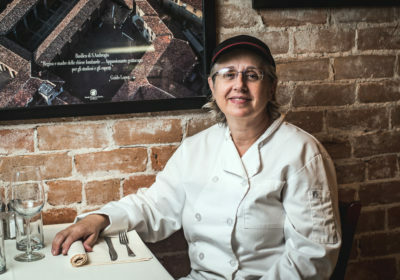 Hamm is a native Tucsonan and has been covering the local culinary and cocktail scene since 2012.